Prime Minister Justin Trudeau said the step would "push the boundaries of innovation". The space station, called Gateway, is a key element in Nasa's plan to return to the Moon with humans in the 2020s. "Canada is going to the Moon," Mr Trudeau told a news conference at Canadian Space Agency's headquarters near Montreal, according to AFP. The robotic arm, named Canadarm 3, will help repair and maintain the Gateway. It is the next in a series of robotic systems built by Canada for the International Space Station. 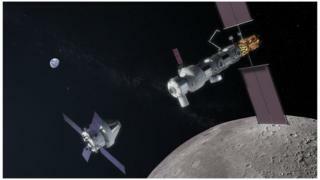 Nasa Administrator Jim Bridenstine commented: "Nasa is thrilled that Canada is the first international partner for the Gateway lunar outpost. Space exploration is in Canada's DNA." He added: "Our new collaboration on Gateway will enable our broader international partnership to get to the Moon and eventually to Mars." According to Space News, Canadian aerospace companies have been lobbying government for years for a new investment for space programmes. Key to the construction and utilisation of Gateway is the Orion capsule, built by Lockheed Martin, which will eventually transport crews to the orbiting outpost and dock with it. Orion will be launched on the new, heavy-lift SLS rocket, which is derived in part from technology developed for the space shuttle programme.